One of the most exciting times in your years in high school will be going to your prom. Whether you're a guy or a girl, it's something to anticipate. Sometimes people start to get nervous as the big night gets closer, but with the right amount of planning, it will be the stuff memories are made of. The whole process from the decision to go to prom until you walk in the door of the prom with your date is a like a choreographed dance. Everyone has a part, and each part is dependent on the next person to do his or her part. Girls are waiting to be asked to prom, and they can't go any further with their plans, such as buying a dress, until they've been invited. Guys can't order their tuxedos until they find out what their dates will be wearing, as traditionally his accessories should match her dress. Each step depends on the one prior, meaning everyone has to do his or her part to make it go smoothly. Invite - The first step in planning your prom evening traditionally depends on the guy. He needs to decide whom he's going to ask to prom and do it appropriately. Even if they're already dating and it's a forgone conclusion that they'll be going to prom together, every girl wants that romantic invite. She wants it to be special. Buying the tickets - This important step also is traditionally left up to the guy. However, if the date is more just as friends, you might decide that each pays for his or her own ticket. Either way, with proms many times being held in a banquet hall, instead of a high school gym, the tickets can be costly. You should take care of the tickets before the other details, so you have a sense of your remaining prom budget. Buying a dress - The girl has her choice of dresses, taking economics into consideration. Prom dresses can be very expensive, so she only needs to make sure it fits within her own budget or one imposed by her parents. She could also be creative like Molly Ringwald in Pretty in Pink and make her own. It's something she'll remember and look back on for the rest of her life, so it should be special and exactly what she wants. She shouldn't need to settle. Make hair appointments - Before she forgets, the girl should make an appointment with her hair stylist, as those prom day appointments can fill up quickly. She'll want to do it the day of the prom and perhaps also get her nails and makeup done. He should also make an appointment to get his hair cut sometime during the week before prom. Renting a tux - Once the girl has bought her dress, the guy is free to order his tuxedo. His date needs to let him know what color her dress is for him to then get a coordinating tux. In most circumstances the tux will be black or white, but the accessories such as tie, vest, and cummerbund need to be in the same color as his date's dress. Arranging transportation - This step is left to either the girl or the guy, depending on their situations. Either one of them can drive to the prom, or many times they get together with other couples and arrange for a limo. It's another option that can be costly, but if a group goes together and all split the cost, it won't be that much per person or per couple. Nevertheless, it's a decision that prom attendees should make sooner rather than later. 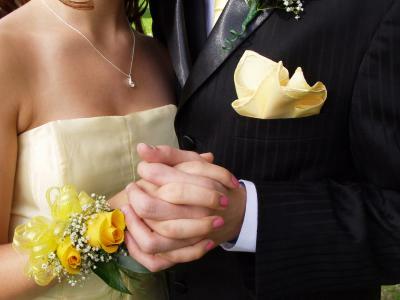 Buying the corsages - You should order a corsage from your florist ahead of time, but you can wait to pick it up until the day of your prom or the day before. This helps to make sure the flowers stay fresh. The guy and the girl buy each other corsages, and again they need to coordinate them with the dress and tux, both in style and in color. Having taken care of all these important steps before your prom, there's nothing left other than having fun. As long as you took care of everything along the way and didn't leave anything to the last minute, everything should go smoothly. You'll be talking about the special evening for years to come!